The name Tacolneston is derived from the Old English for ‘Tatwulf’s enclosure’, and is situated just to the east of the large parish of Wymondham. Evidence has been recovered from the earlier periods of human occupation, though the only extant monument is a possible Bronze Age barrow (NHER 10045) in the east of the parish. More numerous are the artefacts, which date back to the prehistoric period and include areas of burnt flints (NHER 40995, NHER 40997), as well as a Neolithic flaked flint axehead (NHER 10018). There are also objects from the Bronze age such as pottery sherds (NHER 16780), a Late Bronze Age toggle (NHER 23698), two palstaves (NHER 35153) and part of a spearhead (NHER 35834). Unusually a number of Iron Age objects have also been recovered, not limited to pottery sherds (NHER 16780), but encompassing a number of sites with coins (NHER 31943, NHER 33431, NHER 33935, NHER 35023), one of which is even gold (NHER 35678). However, although these sites are all situated in the east of the parish, none are close enough to draw any conclusions on possible settlement locations. Although there are no confirmed Iron Age settlements, there has been a Roman period settlement (NHER 16780) suggested for an area on the southern border of the parish. The density of objects recovered here from the 1980s to the present day, which includes coins, pottery sherds, and personal ornaments, as well as tile and tegula fragments, has been considered indicative of a settlement area. An impressive number of other objects from the Roman period have also been recovered from sites across the parish. This includes pottery sherds (NHER 33431, NHER 34621), coins (NHER 20494, NHER 31826) and metal objects such as hairpins (NHER 31943, NHER 33935), brooches (NHER 35023, NHER 35152, NHER 35918). A number of domestic articles such as keys, figurines, vessels and cosmetic implements have also been recovered (NHER 35831, NHER 37447). There have also been a surprisingly large number of objects recovered from the Saxon period. As well as the more common pottery sherds (NHER 20494, NHER 35025) and brooches (NHER 31505, NHER 35834), part of an Early Saxon bucket binding has also been recovered (NHER 33431), as well as a Late Saxon stone spindle whorl (NHER 35023). 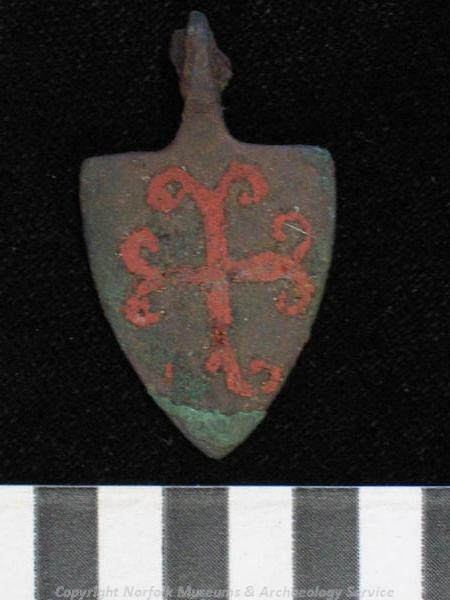 Of particular interest is part of an Early to Middle Saxon chatelaine (NHER 35153) recovered from the east of the parish, as well as a 7th century gold and garnet scabbard mount (NHER 35664) from an area just east of the village. By the time of the Domesday Book Tacolneston was a prosperous area, with a number of ploughs, livestock of many kinds as well as a mill. It is perhaps surprising that there is no record of a church at this time, and the current parish church of All Saints (NHER 9956) dates largely to the 14th to 16th centuries. Inside, the dado from the rood screen survives in sections, and probably dates to the early 16th century. Of possible earlier date are three medieval moats (NHER 9941, NHER 13012), though their identification is uncertain. However there is a site just outside the current village from which a large number of medieval objects have been recovered, and this is thought to be a possible occupation site. Other sites that may indicate medieval construction are limited, however Christmas Cottage and its companion to the north (NHER 41318) may be the remains of a medieval timber-framed hall house with a screens passage. Thatched House and Old House (NHER 19351) in Tacolneston may also be a late medieval timber-framed hall. As with the Roman and Saxon periods, there are also a large number of objects from the medieval and post medieval periods. Although most are too numerous to mention, some are of particular interest. These include a decorated horse harness pendant (NHER 23698), a medieval silver pilgrim badge (NHER 36673) from the southeast of the parish, a medieval gold finger ring (NHER 35023) from just outside the village, and a post medieval silver dress fastener (NHER 35023). Of the later buildings, Tacolneston Hall (NHER 9951) is a handsome Queen Anne house with later additions, originally put up for Edmund Knipe around 1700. In 2000 a watching brief uncovered the remains of a late medieval predecessor to the existing hall. Also of note is Old Hall (NHER 9971), a house built for Sir Robert Baldock around 1700. As well as the main 18th century building there is a timber-framed east wing, which may date to the late 16th century, and it is thought that the house may stand on the site of a medieval manor. There are also over twenty-five buildings listed as of architectural interest by English Heritage, such as Nos 57 and 59 Norwich Road (NHER 35780), which form a 17th century timber-framed building. These are largely scattered along the length of Tacolneston village, though a few are situated on peripheral. The locations of a number of post medieval windmills have also been recorded (NHER 15390, NHER 15392, NHER 15393), and also of more recent date is Tacolneston Park (NHER 32307), an 18th century artificial landscape created around Tacolneston Hall. Of even more recent date is the Tacolneston Transmitter, a 150m high radio and television mast built in 1956. It was one of the first VHF masts built by the BBC and it is reported that the construction work saw the use of the first JCB in Norfolk! Ruth Fillery-Travis (NLA), 16 February 2007. Rye, J., 1991. A Popular Guide to Norfolk Place Names (Dereham, The Larks Press).